IT’S OFFICIAL! Fitzpatrick’s makes the best chowder in Ireland! A record attendance of over 1000 people travelled to Acton’s Hotel for the event which saw chefs from all over Ireland serve steaming pots of delicious chowder to ticket holders, who were also the judges of the event. Members of the public had only one vote to cast for the best of 32 chowders. On entry, everyone received a voting card that allowed them to sample all chowders from the individual stalls before casting their vote. Competition among the chefs, who had travelled from all parts of Ireland seeking the title of All Ireland Chowder Champion, was intense. The chowders were many and diverse, with such variations as a roast red pepper base, queen scallops, lobster, smoked mackerel, mussels, clams, and hand-made ravioli. Crab crostini, seaweed scones and home-baked bread on the side provided a wide variety of tastes and textures. 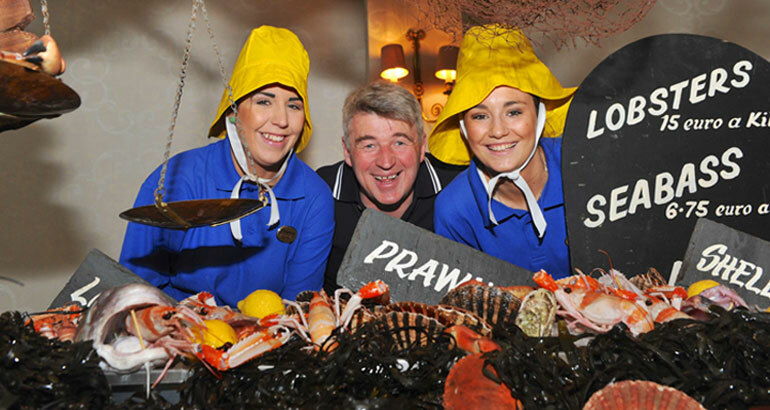 Winner Danny Fitzpatrick received a customised trophy, and will travel to Newport, Rhode Island, USA in June, 2015 to represent Ireland in the Great Chowder Cook-Off, following in the footsteps of Noel Wallace of Bunratty Manor, Clare and John McGrath / Frank Walsh of the West Bar, Westport. The runners-up won weekend tickets to the Kinsale Gourmet Festival in October 2014, and a Kinsale landscape print. The event was preceded by balloon modellers and face painting, and an appearance by the Kinsale Giant Chef, a firm favourite with the children. Later King K entertained the crowd, who lingered enjoying the buzz and the sun.